You can quickly post an insurance payment for each claim that is associated with a bulk insurance payment. You can post insurance payments according to your security rights for the Ledger. 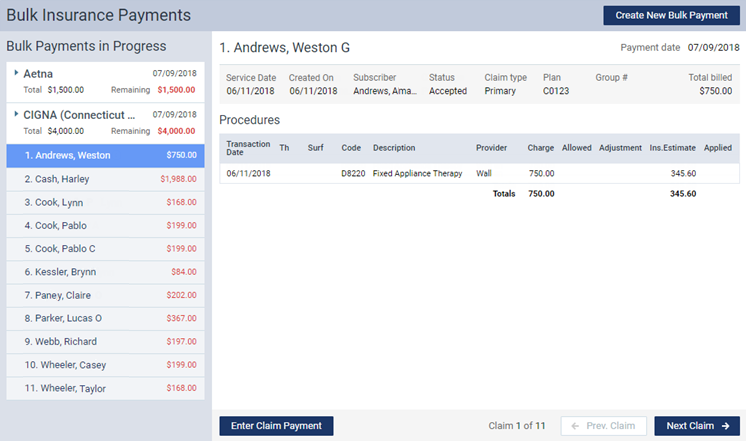 The posting of a claim payment appears in the audit log. Click (or tap) Enter Claim Payment. The Enter Claim Payment dialog box appears. Except for the payment type and claim, enter the payment details as you normally would for an insurance payment, and then click (or tap) Save. You are returned to the Bulk Insurance Payments page. 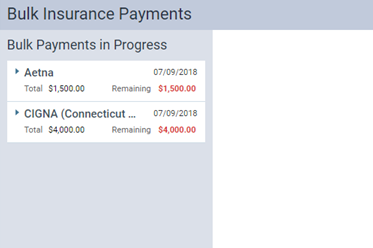 A green check mark symbol appears next to the claim on the Bulk Payments in Progress panel to indicate that an insurance payment has been posted for that claim. The insurance payment and an applicable adjustment appear in the Ledger. 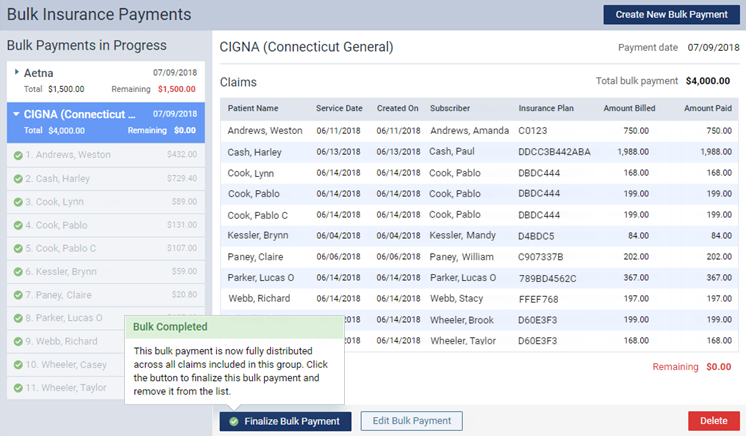 If you edit the payment from the Ledger, the change is reflected in the bulk insurance payment. Click (or tap) Next Claim, and then repeat steps 3-5 until you have applied the bulk insurance payment to all the associated claims. 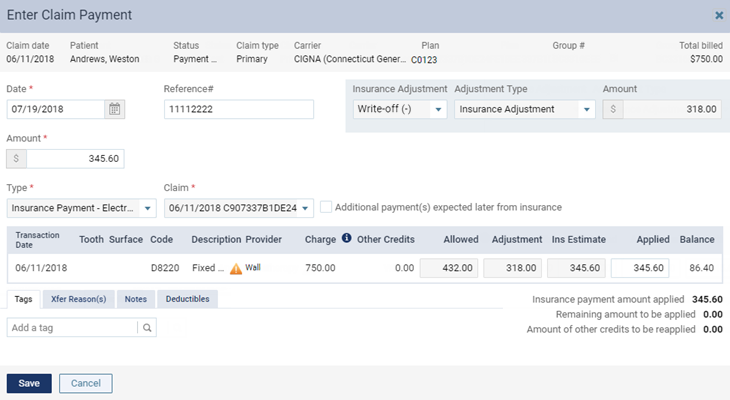 With either the bulk insurance payment or a corresponding claim selected, click (or tap) Finalize Bulk Payment. This button is available only if you have posted an insurance payment for each claim associated with the bulk insurance payment. Note: You can finalize a bulk insurance payment only if the Total bulk payment has been completely applied to the associated claims so that the Remaining amount is $0.00. On the confirmation message that appears, click (or tap) Finalize. 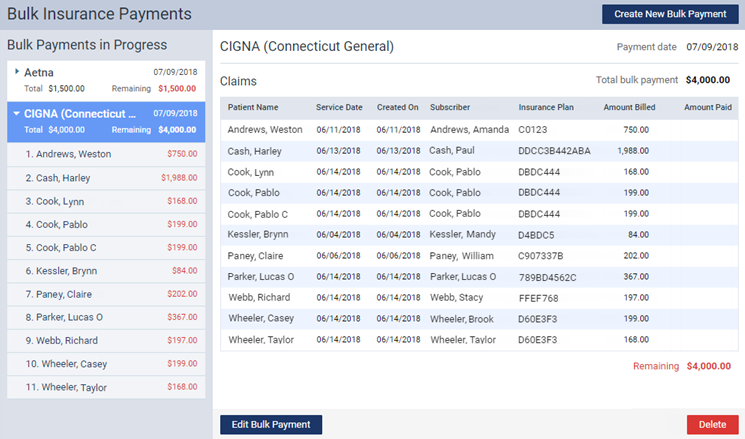 The bulk insurance payment is removed from the Bulk Insurance Payments page.